These bugs have forewings (when present) which are either fully horny or membanous and are held rooflike when not in use. 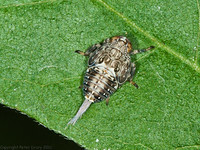 Antenna are short and bristle-like in the cicadas and hoppers but much longer in the aphids and psyllids. They are considered a suborder of Hemiptera. I have kept these apart here on the website but may combine these later. The largest family in the sub order Heteroptera with approx. 6,000 known species world-wide. Bugs from the Sub order Homoptera which include cicada, tree hoppers, frog hoppers, leaf hoppers, aphids, jumping plant lice, whiteflies and scale insects. 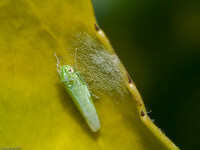 The nymphs of frog hoppers are protected from predators and wide temperature variations by spending their time inside foam on plants (commonly called 'cuckoo spit' which gives the nymph the common name of 'spittle bug'). The foam is created by the nymph puncturing the plant which releases fluid which the nymph foams up. 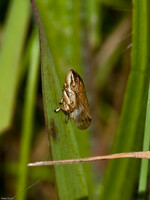 They are similar to Leafhoppers (Cicadellidae) but differ in that there are far fewer spines on the rear tibia. 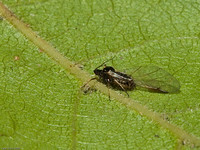 They leap from leaf to leaf and, relative to their size, out-perform a flea in this ability. The general characteristics are: a short antennae ending with a bristle, Simple (not compound) eyes and spiny hind tibia. They feed on sap from a variety of plants and develop from nymph to adult without going through a pupal stage. Species of this family are present in most of Europe, in eastern Palearctic ecozone, in the Near East and in North Africa. Issidae are small insects generally with a stocky body, as the wings mainly develop in width. The basic coloration the body is not striking, usually shows brownish colors. The head has two ocelli. The forewings have strong pronounced ribs. They wrap the abdomen when the insect is at rest. Cixiidae is a family of fulgoroid insects, one of many families commonly known as planthoppers, distributed worldwide and comprising more than 2,000 species from over 150 genera. Cixiid species are typically comparatively small (body size less than a centimeter) and usually inconspicuous. Nymphs live underground, feeding on roots. Adults feed on herbs, shrubs and/or trees; some are polyphagous, while others are specialised on their host plants (monophagous). 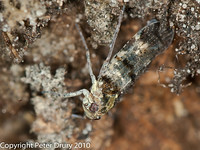 A couple of species are cavernicolous, feeding on roots in volcanic caves. Females occasionally bear impressive "wax tails" produced by wax-producing plates at the tip of their abdomen. A very successful soft bodied insect which is very destructive to plants. Most are associated with one plant species. They all feed on the sap which they 'tap' from the host plants. Most are green although others are black and brown. As they feed, Aphids exude honeydew which is rich in carbohydrates. This attracts ants and some ant species have developed a close attachment to aphids, encouraging the aphid to release honeydew by stroking them with their antennae.